Back in October we took the holiday-of-a-lifetime to Walt Disney World in Florida, staying at the fabulous Balmoral Resort. We’d saved up for (quite literally) years to be able to do it, making the big decision to take the trip to The Magic Kingdom rather than use our hard-earned savings towards the deposit on a house move which is what it had originally been ear-marked for. As much as we are going to need a little bit of extra living space sooner rather than later as our girls continue to grow up, we figured that we’d regret it if we didn’t take the girls to Florida before they got too old to still believe in the Disney magic. I decided a long time ago that I don’t want to have any regrets in my life and I know that when I’m a little old lady sat in a rocking chair looking back at my life I’ll be far more grateful that we took the trip and gave them the experience of visiting the happiest place on earth rather than choosing to spend the money on a pile of bricks. We spent ten brilliant days at Walt Disney World in Florida and, whilst it wasn’t without it’s challenges, we had an absolutely fantastic time and made so many memories together that I know are going to last a lifetime. We’ve been home for three months now and I still haven’t written about it properly thanks to Christmas, multiple birthdays, flu, work and a whole host of other things that have got in the way. I’ve finally made some space to sort through all the hundreds of photos I took and get some words down and it has been so wonderful remembering all the fun we had, the characters we met, the things we did and the places we visited. There are dozens of photographs that have made it onto my list of all-time favourites and I honestly felt myself welling up a bit as I was looking through them, as silly as that probably sounds. I really do feel so very lucky that we’ve been able to have this experience together as a family. I have so much to share that there would be far too much to include all in one post so I’ll warn you in advance that there are going to be a few. I thought that might actually be more helpful for people who are planning a trip to Walt Disney World in Florida anyway as they can just search for the park that they’re looking for more information on rather than having to scroll through my thoughts on everything. This post covers our first few days in Florida when we were still getting our bearings, settling in and adjusting not only to a different time-zone but also to the American way of life. 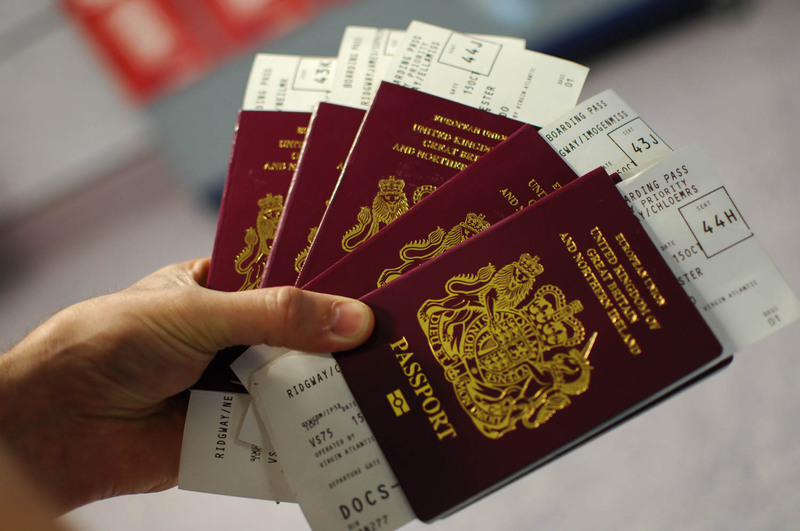 We flew from Manchester to Orlando International with Virgin Airlines, having booked our flights, car hire and accommodation through Virgin Holidays last January. It was a morning flight, 10.30am, and so to follow the mandatory rule of arriving three hours before you depart we’d been up pretty early to make sure we got there on time (the husband, as always, being extra cautious and leaving extra time “just in case” thanks to us almost missing a flight to Greece a decade ago and not wanting to repeat the experience). 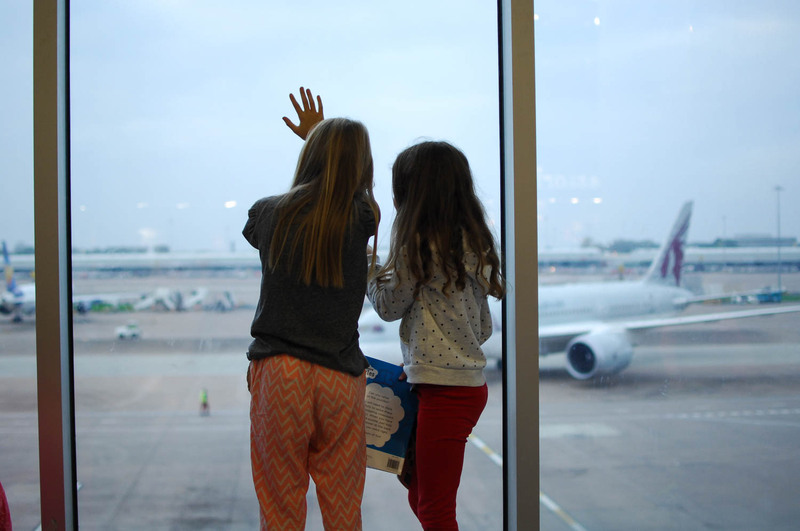 We sailed though check-in, spent a little longer going through security – the girls wide-eyed at being able to see the contents of our hand luggage on an x-ray machine – and then had loads of time to kill whilst we waited for our flight. 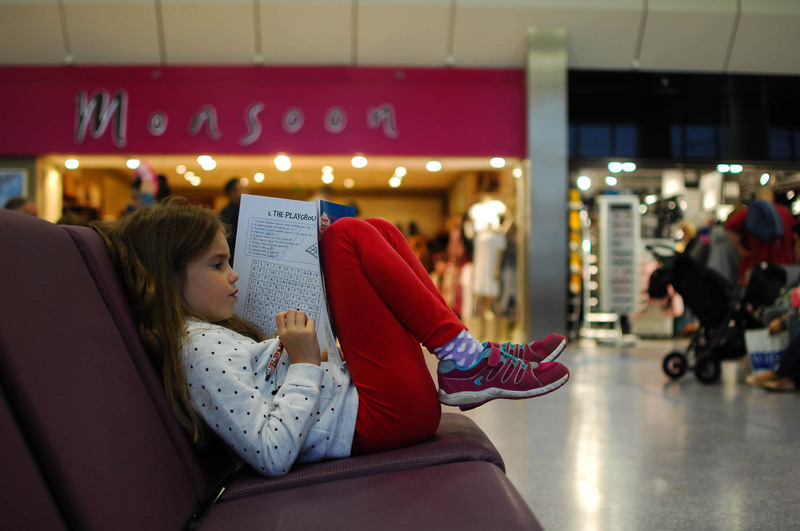 I always pop some crossword and wordsearch books in the girls hand luggage whenever we fly, plus reading books, a magazine and various other things to keep them occupied but let’s be honest, hanging around in an airport is never the most fun thing to do. We watched planes taking off, took silly selfies with our Minnie Mouse ears on and had sleepy snuggles to pass the time before eventually it was time to board. I have to admit, I was dreading the flight a little bit. I’m not a particularly nervous traveller at all but I do find long flights pretty boring and uncomfortable and I’m always really anxious that someone on the plane is going to be sick – that’s the thing I worry about the most, as ridiculous as that probably seems. We’ve never flown long haul before (either as a couple or with the children) so I had no idea how it was going to go. Thankfully I needn’t have worried. Everything went smoothly and the girls behaved brilliantly (they were super impressed that there was a TV screen on the seat in front of them and even more excited that they were allowed to watch films and play games for nine hours straight!). No-one really slept and the only thing that stressed me out a little bit was when we disembarked and someone had been sick in the tunnel – that got me really anxious and I think it was worse because I was tired after the early start and all the travelling and just wanting to get to our villa. Nevertheless I tried to put it out of my mind as we collected our hire car and hit the road, making our way to the place we’d call home for the next ten days. Lola loved being able to watch movies and play games on the screen in the seat in front of her – look at the wonder on her face! It took a while to get to our villa – we hit rush hour and the I-4 is busy enough at the best of times. I have to say though, when we pulled up at our villa and walked through the front door, we all collectively gasped “Wow!” and I knew we’d picked the right place to stay. We claimed our bedrooms, dumped our luggage and headed down to the clubhouse to properly check-in and order some dinner as we knew there was no way we’d make it round the supermarket for supplies without a ‘hangry’ meltdown from someone. The girls tried out the Games Room while we were waiting for our food and declared it to be awesome (to be fair, it does boast that it has the largest game of Pacman in the world, which became ever so slightly additive after a short while), and we watched the sun set over the pool before heading back for some much needed sleep. We awoke the next morning to blue skies, fluffy clouds and sunshine. The husband remarked that it looked like the sky out of The Simpsons and he was absolutely right. I don’t really struggle with jet lag too much so I felt ok but everyone else was still pretty worn out from all the travelling the day before so we decided to have a relatively laid back day of doing nothing more exciting than playing in the pool at the resort. We chose to stay in a four-bedroom villa at Balmoral Resort in Haines City. It only opened it’s doors last March and so everything was absolutely immaculate – spotlessly clean and with every little detail thought of and catered for. It felt really luxurious too – the carpets were so thick that your feet really did sink into them, the beds were enormous (one could quite easily have accommodated all three of our girls AND the teenager!) and the décor was tastefully high quality. It was definitely the right choice for us as a family of six – there was enough space for everyone to escape separately for some peace and quiet if they wanted it and we never felt squashed. We much prefer self-catering villa holidays to hotels – partly because we can never find a hotel with a suite or interconnecting rooms big enough to accommodate all of us, partly because we like to keep to our own schedule rather than being tied to certain times for meals and partly because it feels more like a home from home which I think helps us to relax more right from the moment we arrive. The pool at Balmoral Resort was beautiful. I know that sounds like a strange adjective to use for a swimming pool but it really was with it’s views over the natural lake nearby, the palm trees fringing it’s edges, the sun loungers and oversized umbrellas dotted around and the turquoise water perfectly reflecting the sky. There was literally no-one there and we had the place to ourselves so we spent a couple of hours alternating between the swimming pool and the water park area, which was absolutely fantastic. There were slides and sprinklers galore and a giant bucket that slowly filled up until it tipped over, drenching whoever happened to be beneath it at the time. There was a LOT of squealing as the girls all stood there in anticipation waiting for the waterfall to hit. I was a little bit unnerved when I first spotted this sign but quickly realised that they’re everywhere in Florida and I actually ended up being a bit disappointed that we didn’t see a single alligator! Lola is normally quite timid about trying adventurous things but she loved the waterslides at Balmoral Resort! Sophie waiting for the waterfall to hit her! 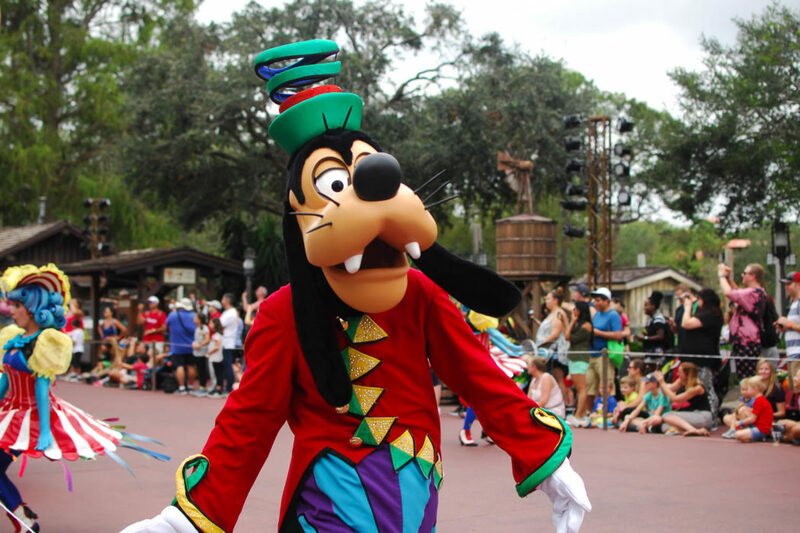 By Tuesday morning everyone was keen to start exploring what Walt Disney World had to offer and so we headed for the most iconic of all the six parks: The Magic Kingdom. It took about 40 minutes to get there from our villa – as I mentioned before the I-4 is the main route to the Disney Parks and it gets pretty chock-a-block with traffic at key points in the day. But we spent the time talking about all the characters we wanted to meet and then turned up the radio and sang along to all the hits I hadn’t heard for a long time. As we drove through the entrance to the Walt Disney World itself, the fizz of excitement that had been quietly bubbling away in my tummy grew exponentially. “Where Dreams Come True”- I certainly hoped so! The entrance to Walt Disney World! We parked up on the ‘Heroes’ side of the car park, caught the monorail to the entrance (an adventure in itself for the girls who had never experienced one before), scanned our cards (which contained both our park tickets and our Memory Maker pass, plus Fast Passes, though we hadn’t booked any for that day) and stepped onto Main Street. Instantly the first thing that hit me was the riot of colour, a kaleidoscope for the eyes in every direction you looked. Next, the number of people – it was super-busy, beyond anything I’d expected. We went in October so everything was decorated in all it’s Halloween-y glory, with Mickey Mouse shaped pumpkins everywhere you looked, Autumnal wreaths adorning every lamppost and shop-windows full to bursting with seasonal gifts. It was a little bit overwhelming for the uninitiated, though I knew that the next time we went I’d know what to expect and it would be fine. We decided to get our bearings a bit before we headed for anywhere specific, so we wandered down Main Street and caught our first glimpse of Cinderella’s Castle. Then I felt like we’d truly arrived at Walt Disney World. There are photo opportunities galore, impromptu song-and-dance routines from cast members around every corner and the attention to detail is absolutely phenomenal. I think that’s actually the thing that blew me away more than anything else – everything has been thought of right down to the tiniest detail. Even the sprinkles on the cupcakes are Mickey Mouse shaped! Our very first glimpse of the iconic Cinderella’s Castle! I’d done a little bit of research before we left, trying to figure out which characters we could meet at which park, which rides we might want to go on and what else there was to do. (Side note: I did nowhere near enough research!). I’d discovered that at The Magic Kingdom you could take part in The Sorcerer’s Quest, which is an interactive game that takes you around the whole park with the aim of defeating all the Disney villains by using Spell Cards to unlock 20 different Magic Portals. It sounded like a lot of fun so we decided to do it. We got briefed on how it all works and picked up our map and spell cards at the Firehouse on Main Street and set off. The trail took us to Adventureland first and after following the clues and opening four magic portals we got stuck as one of the portals wasn’t working, which was a shame. Tummies were rumbling by this point so we abandoned the quest, deciding to come back to complete it another day. After lunch we randomly passed the spot where you could meet Peter Pan, so we joined the remarkably short queue and got the first autographs for the girls books. He was very chatty, asked tons of questions and made us stand like the Lost Boys for our photo. I’m so glad we decided to buy the Memory Maker package along with our tickets – it meant that I could be in the photos too and all the images are instantly downloadable from the app onto your phone (or your laptop if you wait until you get back to your villa like we did). It’s brilliant! We wandered around the corner and stumbled upon the setting-up stages of the Festival Of Fantasy Parade, which occurs every day in the Magic Kingdom. We managed to snag a spot right at the front by the rope boundaries where we ate ice creams (Mickey Mouse shaped of course!) whilst we waited for the parade to start. The parade was, in a word, fantastic. The music, the atmosphere, the characters, the performers… it all added up to an unforgettable experience. The girls squealed with excitement when they spotted their favourite characters (yep, even the older girls), waving like crazy and clapping along with the crowds. It’s definitely a must-see event. The costumes that the performers wore were incredible. The amount of work that must go into creating them all must be enormous! After the parade finished, we headed into Frontierland and saw that the queue for Big Thunder Mountain wasn’t too long. The teenager insisted that it was a pretty mild ride and that it would be perfect for introducing the girls to their first rollercoaster. As we stood in the queue, watching the ride shudder past at top speed, I started to think that maybe it wasn’t such a good idea but everyone else was still up for it, so on we went. Let’s just say that it probably wasn’t the best ride to go on if you’ve never been on anything like that before! Poor Lola was utterly terrified, Ella went green and even Mimi (who normally loves anything risky and challenging) didn’t like it, although after a bit of time had passed she said she’d go on it again. The husband and the teenager loved it of course and so we decided from then on we would divide and conquer – they could go on the fast rides together and I’d take the girls on the slightly more gentle ones! Lola wasn’t too keen on the Big Thunder Mountain rollercoaster, bless her. It took her a while to recover from the trauma of it all. By now it was late afternoon. Each of the girls had a character or two that they desperately wanted to meet and for Ella one of them was Princess Jasmine. I was secretly quite thrilled about this as Aladdin was one of my favourite Disney movies when I was growing up and I still feel so sad that Robin Williams (the voice of the Genie) passed away. We found the character spot and waited for a bit, thankfully under cover as it had started to rain. Like with Peter Pan, the characters were fantastic – both Jasmine and Aladdin were really attentive, asked the girls loads of questions about themselves and posed or photos. It literally made Ella’s day bless her – she was so happy. Meeting Princess Jasmine and Aladdin. Look at Ella’s face! By this point the girls had reached their limit and so we headed home for pizza and to make plans for the rest of our trip. I did sneak out one final time to capture the truly awesome sunset that appeared and I’m so glad I did as it was spectacular. Apart from the slight mishap with Big Thunder Mountain, we all agreed that our first day at The Magic Kingdom was a success and we all went to bed excited to see what the other parks had to offer. Here is a little video I put together of our whole trip. The girls have watched it seven times already and keep asking to see it again as it brings back such happy memories of our family trip. I’m so glad I decided to film our holiday as it means we’ve got this to keep forever to look back on and even show our grandchildren in the years to come. Jenny recently posted…Mama Mio Skincare + ULTIMATE GIVEAWAY! I never went as a child – I think that because you’ve already been it’ll be even more magical to see it through your children’s eyes. Keeping my fingers crossed you get lovely weather (and hardly any queues!). It was such a special trip Morgana. I know I’m writing lots of posts about it but honestly I have so many photos to share and such a lot to say about it that I couldn’t contain it all to just one post! Oh my goodness, this post has got me so so so excited to be going in a couple of months time. The girls are going to love it all, just as yours look like they did. The pictures are amazing and your video is such a brilliant memory of your special once in a lifetime holiday. I can’t wait to see Lili’s face when she sees all the Star Wars rides and Poppy’s face when she sees all the princesses and Iris is going to love all the Frozen stuff!!!! And I’m literally going to LOVE it all…. Haha you will love it all I’m sure! The Frozen stuff is brilliant – definitely meet Elsa and Anna (in Norway at Epcot), and Olaf (Hollywood Studios), and DEFINITELY go and see the Frozen show at Hollywood Studios too – it’s hysterical. The Star Wars stuff is brilliant too – my husband was like a little kid he was so excited bless him. The villa we stayed in had it’s own pool too which was brilliant for when we just wanted to hang out and have a quiet day. It was great having the extra choice of the resort pool too though (and there was never anyone else there!) – best of both worlds 🙂 I can highly recommend Balmoral Resort – it’s top quality. Excellent blog! Looking forward to the continuation. We are booked for 1st week in Nov 18. Thank you John! You’ll have a fantastic time – the villas at Balmoral are top quality, the pool is beautiful and the games room is super fun. I’m a little bit jealous that you’ll be getting some winter sunshine – we’d love to go back! Hi Chloe I thoroughly enjoyed your blog and beautiful photos. We are going to Balmoral in 17 days time, counting down the days. We’re staying in a five bedroom villa as there are ten of us going – grandparents, parents and grandchildren and yes it is a holiday of a lifetime for us. We’ve tried to plan our days but reading your blog I think we might have to change our plans as we might be a little ambitious as ages range from 5 to 70! Now looking forward to reading the next part of your blog. Thanks Suz, I’m glad you enjoyed reading it. Balmoral is fabulous and I hope you have a wonderful time. Thanks for pointing that out – I had no idea! So glad to come across this blog, we have booked to stay at the Balmoral Resort next October. We are taking our two boys for the first time, in fact it will be my husband and I’s first time going together too. We are also going with my best friend and her family too. It was so nice to read that the resort is a lovely place to stay, I haven’t come across a lot of people that have stayed there. Oh Louise you are going to have such a wonderful time! It was our first ever trip to Disney as well and Balmoral Resort is just such a brilliant place to stay – they really have thought of everything.